Did you see us on the Channel 7 News During the Golf Show? Boyne Mountain Resort is Northern Michigan’s leading destination for Segway tours, and Great Lakes Segway is proud to partner with them on their new Segway PT fleet! Segway x2 PTs, Segway’s more off-road model, have been used at Boyne Mountain Resort for 3 years, and it was time to trade in these machines (due to a lease). 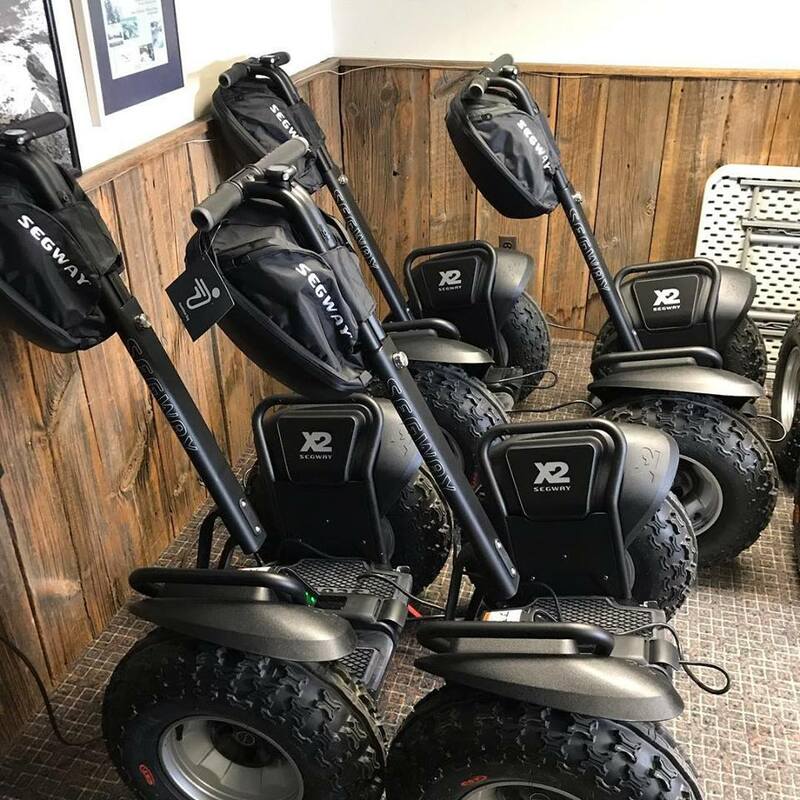 Great Lakes Segway provided eight new x2’s, along with all of the service, maintenance, and assembly. Segway tours through the forests of northern Michigan have been a popular attraction for years at Boyne Mountain, and Great Lakes Segway is helping them continue that success for years to come. These units are still in great condition, but Boyne Mountain’s lease allowed them to upgrade to brand new machines. Each unit features SegAutostand kickstands (a more permanent kickstand than the traditional model) and handlebar bag, a perfect solution for your tour or off-road needs. Service & Repair was also an important part of Boyne Mountain’s purchase. By partnering with GLS, Michigan’s only authorized Segway dealer and service center, Boyne Mountain has the peace of mind that comes with knowing their Segway PTs will be cared for and maintained for years to come. These new machines will be running smoothly for every rider, every day. If you’re interested in Boyne Mountain’s exciting Segway Tours, click here to learn more. Boyne Mountain’s tours aren’t something exclusive to their property! Call today to see how Great Lakes Segway can help you bring the Segway experience to your customers. The Walled Lake Police Department just purchased their first Segway i2 Patroller from Great Lakes Segway! This Patroller comes with StreetSmart upgrades, and will be a huge boost to their community policing efforts. 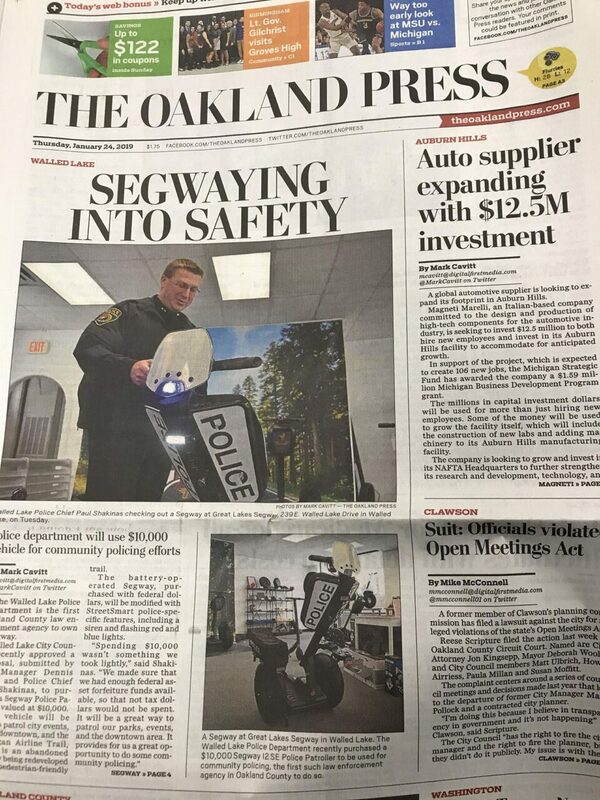 A Segway i2 Patroller gives a city like Walled Lake new options and solutions for their community outreach, giving them an engaging and fun tool to interact with. In Walled Lake, community events like the Memorial Day Parade, Summer Beach Party, 4th of July fireworks, and more will be made safer with the i2 Patroller. Its sleek design, improved sightlines, and distinctive lights will help with crowd control, while also bringing positive attention to the department. As the Michigan Airline Trail gets completed, Walled Lake’s i2 Patroller will be a key solution in watching over the city’s portion of the trail, as this Patroller can go where cars and carts cannot. Great Lakes Segway is proud to be a supporter of our local community and department, and would love to help support your city in the same way!